After initially using the stone-paste body to imitate the white Chinese porcelains, the Islamic potter in his accustomed way started to add colour. First he added a single colour to the glaze – cobalt for blue (no. 7 [EAX.1206]), manganese for purple, or, as here, copper for turquoise. In a lead glaze copper turns green (no. 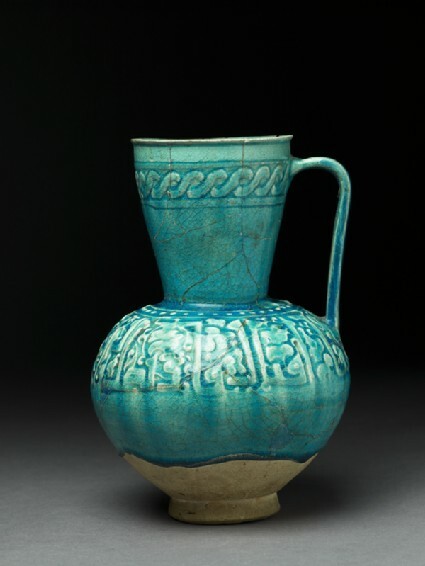 4 [EA1974.48]), but in the alkaline glazes used on stone-paste it turns turquoise, and it is this turquoise which has been the hall-mark of Persian ceramics and tiled domes ever since its introduction in the eleventh – twelfth century. The design on the jug is calligraphic, using stylised kufic script. Calligraphy was of far more importance in Islamic culture than in the Christian west. The Arabic text of the Koran was considered to be a transcription of an eternal Koran, written in Arabic, kept in Heaven. The words and letters thus had a holiness of their own. Taken alongside the antipathy towards the use of images in a strictly religious context (p.4 [Introduction]), this explains why the decorative possibilities of the Arabic script were so fully explored by Islamic artists, and accounts for the popularity of calligraphic designs, in media, like ceramics, less suited to them. Here the Arabic words for ‘glory’ and ‘prosperity’ gives the impression of having been designed by an illiterate craftsmen. His customers, however, would have been uplifted by the presence of Arabic script on their purchases, and even if they too were illiterate, would have taken it as symbolising the good wishes which were the potter’s original intention.